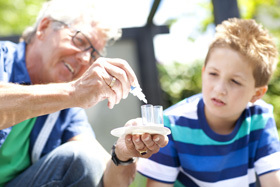 When you test the water of your pond, you are investigating the so-called water values. Correct water values in a pond are of importance to secure a beautiful clear pond having a proper biological equilibrium. The quality of the water is determined by the substances that are dissolved in it. Hardness forming substances may be involved here, like Calcium and Magnesium; however, it may as well be primary nutrients for plants such as phosphates and nitrates. Furthermore the water contains important gases like oxygen and carbon dioxide, but also poisonous methane gases. The aforementioned and many more substances finally determine the quality of the pond water. A large number of the substances dissolved in pond water can be determined using a water test kit. Such a pond test kit can be easily used. It contains the most important water tests, namely the pH-, GH– and CH-values. It is advisable to carry out pond tests regularly. Is one or more of the following problems bothering you in your pond? Then it is import to (let) test your pond water.